“Economical depression”, the word repeats everyday everywhere. Cheap stand-and-drink bars (tachinomi izakaya) get crowded every night, and inexpensive fast fashion including UNIQLO are sold well. Against those facts, I had wondered “are we really in that bad?” but some pictures taken in Tokyo made me realize that “we’re surely in depression”. 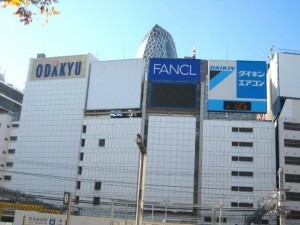 Buildings in front of Shinjuku Station. 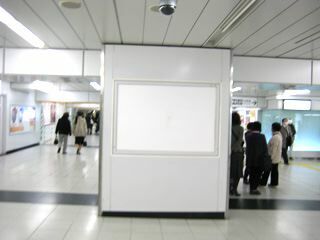 The billboards usually filled with advertisement but some are blank now. 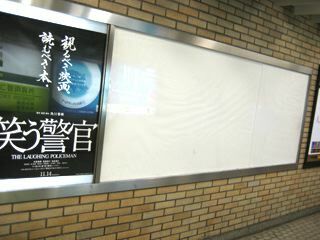 A white billboard around Shibuya Station. It’s nicely contrasted by the blue sky. 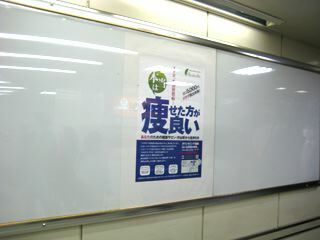 A billboard in a subway station. 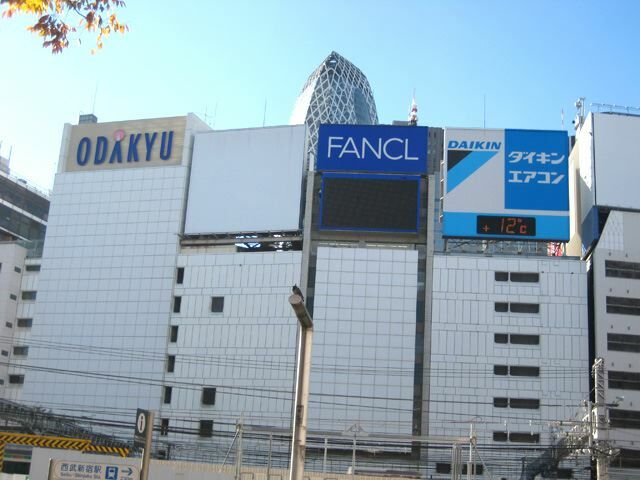 Can’t believe there is a blank billboard in such an excellent location. It may have never happened before. The third one says “Better Get Thin”. 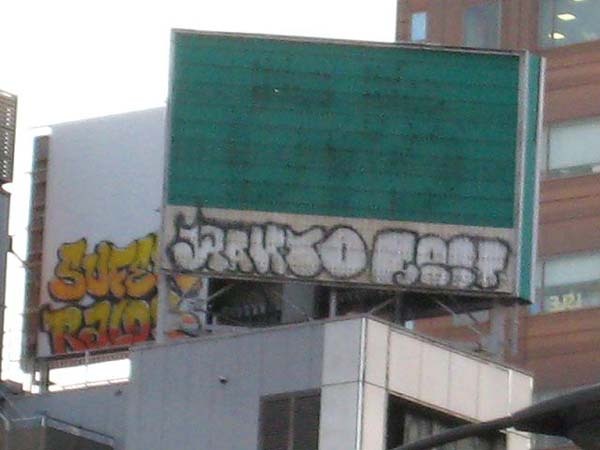 Mystery Graffiti (illegal spray paint) on billboards! 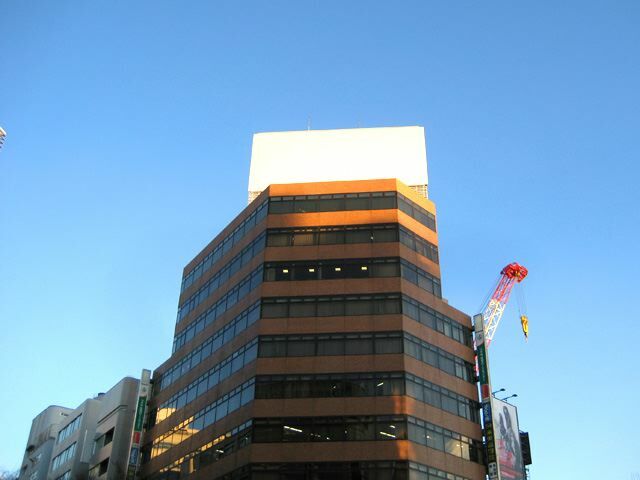 Who and how painted there on such high building!? The scenes of blank billboards are unusual to those who have lived in Tokyo for a while. There must be more white billboards nationally. I feel like Japan is in a depression most of the time too, but then I see people spending money all around me. You’re absolutely right. Although it’s in a depression, people are spending money on fashion, food and vacations. I don’t understand that either LOL. 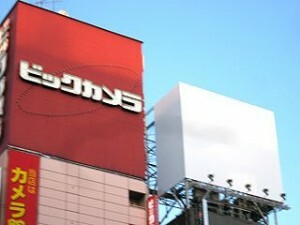 Not only those billboards, but also magazines are disappearing, especially since this year. Such phenomena never happened before. Part of it is the Great Internet Shift. I don’t read papers anymore, I read RSS feeds of the New York Times. No ads, takes 1/10 the time, I can do it from my iPhone. Remember, Japan has 5% unemployment, but it’s 25% in parts of the U.S. like Ohio. This is why people will still come here. That’s true. Paper ads have been shifting to the online ads. In Japan, a lot of magazines have been discontinued since last year. Ohio has 25% unemployment? That’s a high rate. I wish that doesn’t happen in Japan.